With some expert advice from my sister, I charted a pattern After designing pattern, next step: Test design and yarn. Months ago, I vowed I would make new curtains for my bedroom. Full of energy and enthusiasm, I tore down my old curtains and washed the blinds and the windows. After I bought some nice cotton-rayon yarn, I waited for the magic to happen. Eventually, it dawned on me that there was no Rumpelstiltskin to come in the middle of the night to weave the curtains. Further, I finished a small weaving project last week, and with the loom sitting there undressed, I decided I’d better get to work. Although the general rule of thumb is to test yarn and pattern before embarking on a new project, I very often flout the rule, as I’m pretty certain most everyone does. However, since this is quite an extensive (and expensive) project, I decided I’d better do a test. Huck lace will be the pattern. I’ve never woven huck lace so had no experience on which to draw. 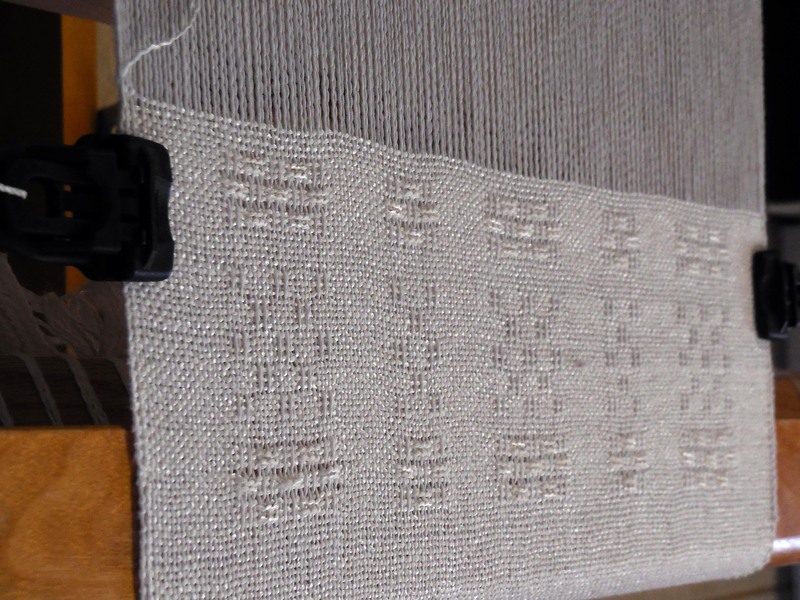 After consulting my sister Ruth, I made the plan for several vertical lace stripes of two widths and prepared to run the test. What you see here are some shots of the beginning. 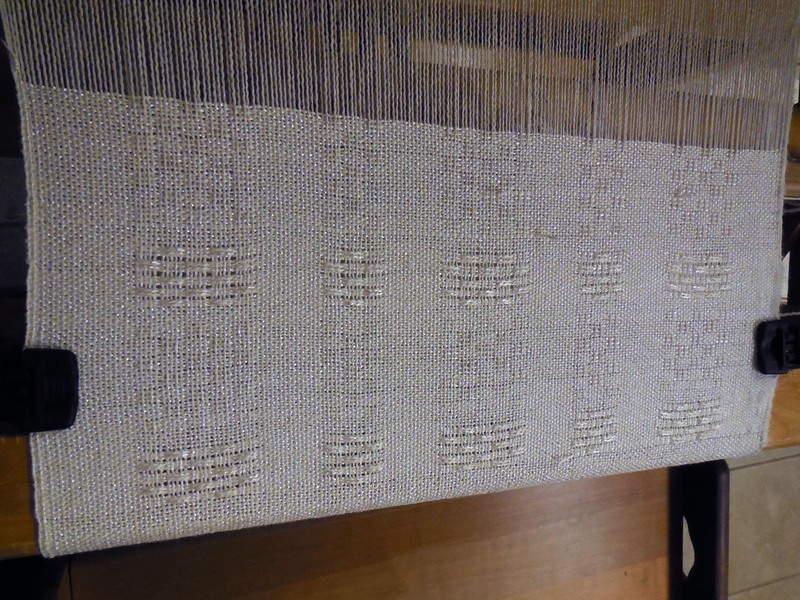 After the fabric comes off the loom, it will relax a bit. It will be washed, then the lace will show better. But for now, we have to imagine how it will look. Although I liked the widths of the lace stripes, I made an alteration in the lace which I like much better. Now to finish the test and see how the fabric washes and measure shrinkage. Then I get to warp miles of yarn. Guess what that means … I get to use my new Trapeze! I can hardly wait. This is a huge task to be undertaking! I’ll be very interested in following your progress! What an amazing undertaking….the store for us. it really looks like a project to be proud of! Thank you for your kind words. I’m hoping for a positive outcome. So far this project has been riveting. I have to make an adjustment which I will write about shortly. But, I’m committed (or, perhaps, I should be committed) to making it a success (to an asylum). Stay tuned. I’ll be writing about it again soon.